As usual, we shall not be meeting in August. Our next meeting will be at 7.00 p.m. for 7.30 p.m. on Monday 11 September. 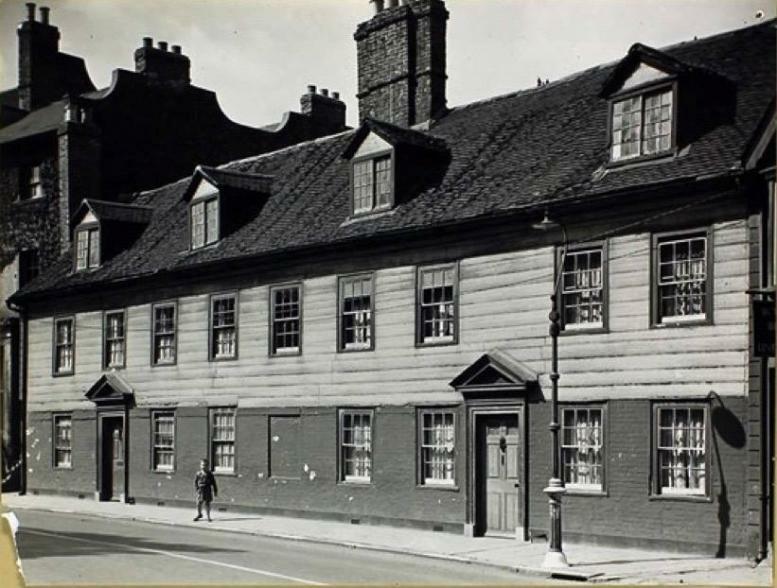 This prominent Malling Street building was demolished in the late 1960s, to make way for the construction of Phoenix Causeway and a second bridge across the Ouse. At first sight it looks like a terrace of houses, but there don’t seem to be enough doors. What was it? Does anyone recall? 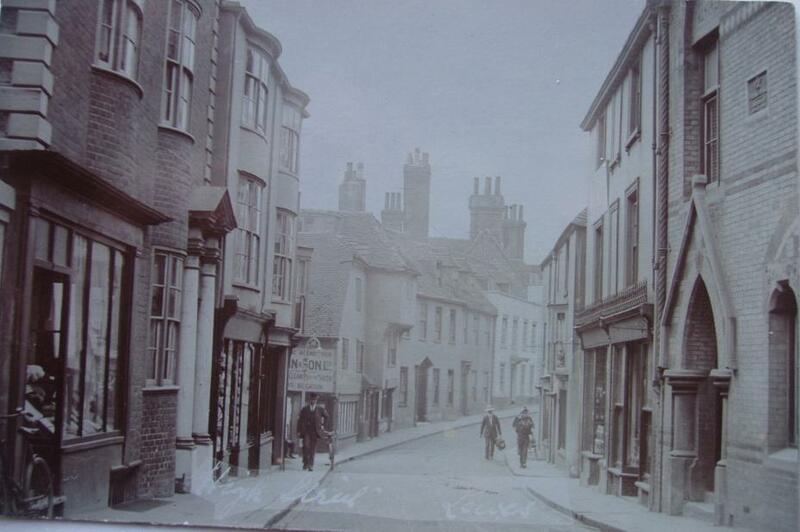 Source: Image posted by Ian Freeston on the Lewes Past Facebook site. The Bishop of Chichester’s 1724 survey of the churches in his diocese asked questions about the incomes of the incumbents of the parishes in his diocese. His four Lewes parishes and Southover were all rectories, so the incumbents were entitled to a tithe of 10% of the value of the agricultural produce of the parish, plus the produce of any glebe land and the right to live in the parish rectory. However, the tithes were much more valuable in a rural parish than in an urban area. In Lewes the tithes of St John-sub-Castro produced £140 p.a. and there were also 3 acres of glebe land. In St Peter & St Mary Westout (St Anne) the tithes of the two rectories united in 1538 (after the closure of Lewes Priory) amounted to £60 p.a. and there were 4 acres of glebe land. Both these parishes included substantial acreages of farmland to the north and west of the town. Tithe incomes were much lower in prosperous but entirely urban parishes like St Michael (£13 p.a. and no glebe) and All Saints (£10 p.a. and no glebe, but made up to £30 p.a. by voluntary contributions). Urban trading incomes were not subject to ecclesiastical tithes. Southover parish included more farmland but most of its tithes had belonged to the Priory, and thus been nationalised at the dissolution and then privatised. Here there was not only no glebe, but not even a parsonage, with the income only £16 p.a. The Rector of Cliffe could similarly expect only £30 p.a. Rural clergymen were far more prosperous, even when the tithe income had to be shared between the vicar and a lay rector. Often the lay rector took the easily-collected corn tithes, leaving the vicar to lay claim to the rest. Nevertheless the vicars and rectors of such parishes as Ringmer, Barcombe, Chailey, Hamsey and Firle could rely on an income of £120-£200 p.a. Source: Sussex Record Society volume 78. The Gentleman’s Magazine regularly published lists of recently deceased clergymen, to alert others, seeking preferment, to opportunities that had become available. The example below was included in September 1825. By the end of the 18th century it became apparent that All Saints churchyard was too small to accommodate decently the needs of the increasingly populous parish. In August 1798 the parish reached an agreement with Lord Pelham and Thomas Pelham to purchase an adjoining plot of land, to the west of the church, for £25. However, the parishioners also had to agree to cover the cost of the removal of the buildings standing on the new burial land to an alternative plot owned by the Pelhams, which cost them a further £110. The two postcards below were offered for sale in April by the same seller, who has been disposing of a collection formerly owned by the West Sussex Libraries service. 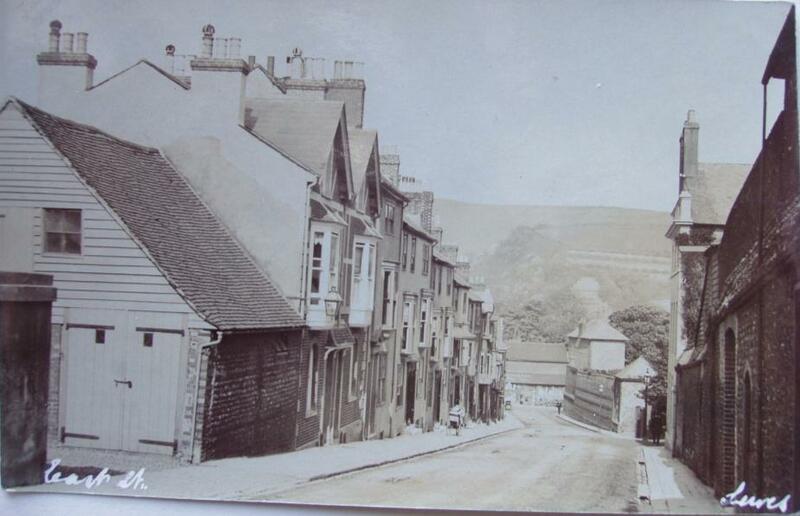 The postcard of East Street is labelled on the reverse as published by ‘Cheetham, Lewes’, and while the postcard of the High Street bottleneck is anonymous, its caption in a similar hand. Both were stamped ‘Chichester Local Studies’ on the reverse. The High Street card sold for £92 and the East Street card for £102, to different buyers. The successful bidders for each card were also the under-bidders for the other. On 19 November 1923 George Menteth Boughey of Highwold, Woldingham, Surrey, completed the purchase of Malling House from Mr R.H. Powell. For the price of £7,500 George Boughey acquired Malling House itself, two cottages, some stables, gardens and a total of 13 acres 3 roods and 5 perches of land spread along Church Lane. An associated plan shows that there was only one other house along Church lane between South Malling Vicarage and its junction with Malling Hill when the Boughey family, with five young children, made Malling House their home. They looked out across Malling Brooks towards Lewes itself. George Boughey (1879-1959) had been a civil servant in India. In 1927 the death of a cousin meant that he became Sir George Boughey, 9th baronet. The title came unencumbered by responsibilities, as the family estate in Shropshire passed to the 8th baronet’s daughter. Malling House was of course the Boughey family’s country house – they also maintained a London House, 25 Lowndes Square. His daughter Hermia, then a small child, recalled “We would not, once we had seen Malling, have exchanged it for any other house in the world. For Malling was, quite simply, our idea of perfection”. She added: “Malling stood in the pleasant Sussex country north of Lewes, with the Ouse flowing unhurriedly at the bottom of the fields behind the house, and bringing with it at high tide the tang of salt air from the sea”. She recalled cricket on the lawn, reading aloud around the fire on winter evenings, games of hide and seek in the darkened house and “the entrancing spectacle of Fifth of November celebrations at Lewes, where flaming tar barrels were rolled down the hill through the town, and the Pope still burnt in effigy”. Sources: The Bush, Morse and Welling client sales book, ESRO BMW/A/14/9, p.84 and Hermia Priestley, ‘John Boughey, A Memoir’ (1947), Ditchling Press. Hermia’s book was a tribute to her brother John Boughey (1919-1940), who went from Eton & Cambridge to Sandhurst and the Coldstream Guards on the outbreak of war, but was killed in an attack on an enemy convoy in the North Sea when the destroyer H.M.S. Express struck a mine. 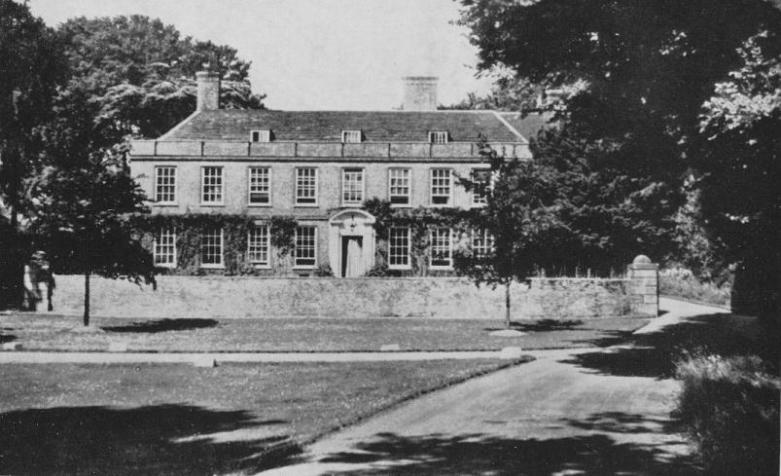 John’s younger brother Richard Boughey became the 10th baronet, and for many years lived at Ringmer Park, inherited from an uncle. Just a slight correction is needed to the item in Bulletin No.83 about the two female Mayors of Lewes Borough. Anne Dumbrell was the Headmistress of St. Anne’s Church of England School in De Montfort Road, which I attended 1944 to 1947, prior to her being appointed as Head of the Special School as noted. I have in my possession a copy of a photograph taken during an afternoon outing to a private garden on Houndean Rise in the summer of 1947 (below). Miss Dumbrell is in the photograph together with a 7 year old Peter Fellows, and many other school friends who I am still in contact with 70 years later! The Sussex Record Society’s ‘Bibliography Index’ website is now available to the public. It can be searched by subject, place, surname or author. It primarily covers historical sources but does include subjects such as geology and natural history. It omits, with a few exceptions, most government publications — something I regret. Books, pamphlets, theses and journal articles are all included although some material still remains to be added. Of course there will be gaps — especially as a decision was made not to include Internet-only articles, such as these Lewes History Bulletins, which are steadily growing in number. Editor’s Note: This new resource will be invaluable for new students of Sussex history. It works very well for village sources, but so much has been written about Lewes that our town lists (there are separate sections for Southover, the Priory and Lewes Guidebooks) are perhaps inconveniently long. On the Lewes History Group website Lewes sources are subdivided by topic. This entry was posted in Art & Architectural History, Biographical Literature, Ecclesiastical History, Education History, Lewes, Local History, Social History. Bookmark the permalink.